Crowd sourcing logo design is a Fine Idea. Charging a service fee as the marketplace is a Great Idea. Charging for add-ons that genuinely improve the experience is Downright American. 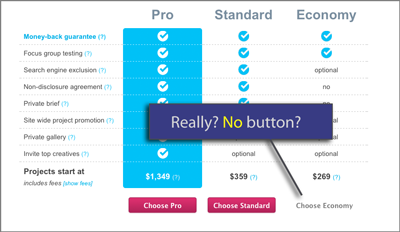 Using visual gimmicks to steer people towards the higher-profit choices is Commonplace. But Crowdspring.com more than doubling the service feeto keep a project private is ridiculous, cheesey, nickle-and-diming at its worst. 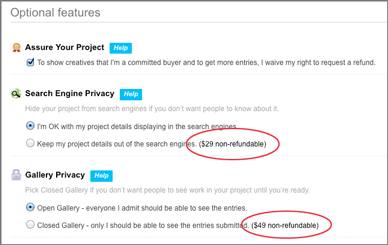 Personally, I’m fed up with companies that try to milk every single penny out of a transaction when they take it to the extreme of charging me to NOT publicize my project.